Fall in Chicago is officially underway and, along with some sweater weather, it's bringing along plenty of ways to keep yourself entertained. When you're not working on your Halloween costume, you can hang out at an outdoor pop-up bar with its own corn maze, spend an evening at the opera, see Gorillaz at the United Center or sit down for a meal at a restaurant that serves unlimited Alaskan king crab and burgers. Get out your calendar and start plotting out a month of parades, concerts, festivals, theater and art exhibitions with our guide to Chicago best October openings. The circus with a killer soundtrack returns to Chicago to celebrate its 25th anniversary with new stunts and the event's traditional Soul Train line. A two-acre plot of land near Goose Island is filled with a corn maze, bars, a pumpkin patch and more at this autumnal pop-up experience. The fun is family-friendly until 7:30pm each night, when the booze begins flowing. Sample dishes from 5411 Empanadas, Da Lobsta, Pink Taco, Whadda Jerk and more local food trucks at this fest near Eckhart Park. Sample bacon-heavy dishes from the Berghoff, Connie's Pizza, City BBQ and more local eateries before washing it all down with more than 100 craft beers at this Soldier Field bash. Kick off autumn with hot apple cider, freshly baked apple pie and a variety of other apple-based goods at this annual Lincoln Square fest. Runners from all over the world hit Chicago's streets for a 26.2-mile race that winds through Lincoln Park, Chinatown, Pilsen and more of the city's neighborhoods. You can line the streets, make a sign and cheer on the participants. See more than 100 movies, such as Beautiful Boy starring Steve Carell and Timothée Chalamet, Joel Edgerton’s Boy Erased and Steve McQueen’s Widows during this high-profile film festival at AMC River East 21. Fremont, Jackie O's, Jester King, Mikkeller and many other breweries that rarely have beer on tap in Chicago gather for this Half Acre-curated festival atop the Harris Theater. Have a drink underneath some dinosaur bones and enjoy rare and sought-after selections from the likes of Hopewell, Noon Whistle, Surly and more than 60 other breweries. Explore the buildings you've always wanted to peek inside of during this city-wide open house, which includes 250 churches, skyscrapers, historic homes, theaters and more. Find new pop culture-inspired pins and patches to decorate your denim jacket at this festive market featuring local creators and makers. Wake up and get down (dog) at Yoga on the Lake presented by Bloody Mary Fest, where you can roll out a mat at Theater on the Lake and participate in a 60-minute vinyasa flow. Chicago's top restaurants and bars gather to showcase their savory brunch cocktails at this annual battle, where one Bloody Mary will be emerge victorious. See Secretary of State John Kerry, #TimesUp cofounder Amber Tamblyn, Sorry to Bother You director Boots Riley, gun control activist David Hogg and more luminaries and thought-leaders take the stage at this series of panels and conversations. Journalists, writers, filmmakers, poets, musicians and more talented people take part in a variety show that's designed to replicate the experience of flipping through your favorite magazine. 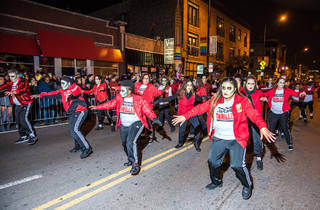 Celebrate Halloween a few days early as a procession of creative performers, puppets, lanterns and floats march down State Street. Dogs aren't usually allowed in the Chicago Botanic Garden, except during this annual parade where you'll see plenty of pups (and their owners) sporting creative costumes. Kids and their families can enjoy Ferris wheel rides, a corn maze, animal-enrichment activities, live entertainment and a pumpkin carver during a pre-Halloween party in the zoo. Academy Award-winning actor Tom Hanks, Broad City co-creator and star Abbi Jacobson, Two Dope Queens co-creator and podcast host Phoebe Robinson and more famous folks come together to celebrate human creativity at this series of events and talks. The Chicago Athletic Association invites Halloween revelers to take refuge in its Stagg Court, where house DJ Pierre will be soundtracking a festive (and spooky) evening. Put on a mask and attend this swanky Halloween gathering in the Drake Hotel's Palm Court, where you'll be able to sip Spooky Sangria and hear live music from the Flat Cats. Zombie cocktail servers, vampire bellmen and costumed go-go dancers roam this haunted Halloween party on Michigan Avenue, where a costume contest could earn you $2,000 for your creative get-up. 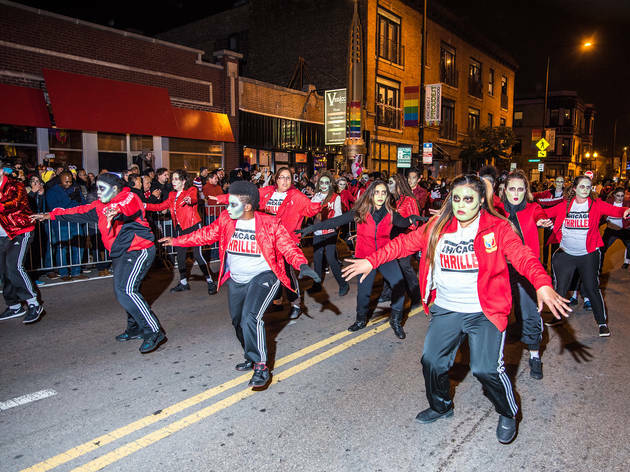 If you want to see some of the most creative costumes in the city (and a Thriller flash mob), you need to make your way to Boystown on Halloween. English rocker-turned-adult contemporary mainstay Sting teams up with Shaggy (of “It Wasn't Me” fame) for a performance in support of the pair's reggae-tinged collaborative album. The guy behind “The Shape of You” brings his tussled mop of hair to the home of the Chicago Bears—a venue he first played while supporting Taylor Swift in 2013. One half of Chicago über-indie darlings the Fiery Furnaces returns to Chicago in support of her latest ’80s goth-disco solo album. Man of the Woods wasn't J.T. 's proudest moment, but we'll still show up to see the dapper pop star bring “SexyBack” in an arena. Prince's former backing band celebrates the life of its late collaborator with an evening of music that pays tribute to the Purple One's revolutionary spirit and sound. Founding member Lindsey Buckingham is no longer part of the Mac, but Tom Petty guitarist Mike Campbell and Crowded House frontman Neil Finn will help bring your favorite Rumours tracks to life. The Lyric Opera kicks off its 2018-19 season with a production of this classic Italian opera that served as the inspiration for the musical Rent. Local hip-hop legend Fiasco hits the stage at this rescheduled show, performing in support of his sprawling new concept album, Drogas Wave. After a triumphant Riot Fest set, Phair returns to the city where she developed her confessional alt-rock sound for a pair of sets in Wrigleyville (not far from where Guyville was born). The soaring melodies of Wolfgang Amadeus Mozart soundtrack this tale of the King of Crete, who is asked to sacrifice his son to the Gods. Prepare for an evening of dissonant synth-pop ballads and motorik instrumental tracks at this rare appearance from the English experimental act, which features Portishead's Geoff Barrow. Former The Voice judge Aguilera puts her powerful pipes to work during a two-night stand that is sure to draw upon her early-aughts hits and selections from her latest album, Liberation. Combining reggae, rap-rock and a bit of ukulele balladry, the Ohio duo unleashes its latest chart topping hits at a sure-to-be-packed arena show. While the group may not actually be “the loudest band in New York,” your eardrums will still be tested by the piercing squalls that A Place to Bury Strangers’ custom guitar pedals produce. Columbian-American singer Uchis shows off her range by diving into a set of sultry R&B numbers and reggaetón anthems. Singer-songwriter Mitski Miyawaki unpacks the emotionally charged compositions of her latest disco-tinged album, Be the Cowboy. Trent Reznor and Atticus Ross take over the Aragon for three straight nights, exploring NIN hits and rarities—needless to say, if you don't already have a ticket, you'll need to call in some favors. Sir Elton is saying goodbye to the touring life with a final string of shows, taking the audience on a massive visual journey spanning his entire 50-year career. Sprawling hip-hop collective Brockhampton turned in a triumphant Lollapalooza set this summer—now the group is back to show off the aggressive, blown-out bass drum anthems of its latest LP. Start assembling your Boognish costume and learn the lyrics to “Mutilated Lips” in preparation for this special HalloWEEN show. The Chicago Philharmonic performs Danny Elfman's classic score in front of a screening of Tim Burton's tale of Jack Skellington's journey to Christmas Town. Two men make a deal with the devil, while the town outcast (a woman whom everyone suspects is a witch) stands her ground. Stuck in a dead end job, unlucky in love and completely absorbed in the internet, Tom is drawn into an online community called Order of the Sword. On the 40th floor of a swanky Swiss hotel, 10 people from all walks of life find themselves stumbling towards a shared fate. Based on Mark Haddon’s hit novel, a young man on the spectrum sets out to discover who killed his neighbor’s dog. Guests must sign a nondisclosure agreement before entering this immersive theatrical experience inspired by the works of Edgar Allan Poe. Actors Nick Sandys and Greg Matthew Anderson alternate the roles of Victor Frankenstein and The Creature in this adaptation of Mary Shelley’s seminal horror classic. A new epic from Chicago playwright Calamity West spans from 2007 to 2067 and explores a world where Roe v. Wade gets overturned. Spoiler alert: It doesn't go well. Six strangers attempt to work out their issues on a silent, weeklong retreat in the woods. What could possibly go wrong—or right? Two young black teenagers—one from the burbs and one from the inner city—meet in a holding cell and begin a fierce debate over what it means to be black in America. Broadway legend Betty Buckley stars as mischievous matchmaker Dolly Gallagher Levi in this revival of the classic musical. This absurdist existential comedy from theatrical titan David Rabe gives one man’s bad date the multiverse treatment—think Bugs Bunny meets Kierkegaard. Serial ranter Black returns to the Chicago Theatre for another night of tirades about politics, religion, popular culture and anything else that's currently infuriating him. After confronting stereotypes in his recent documentary The Trouble with Apu, Kondabolu brings his socially conscious and insightful stand-up comedy to Pilsen. The NPR quiz show celebrates its 20th anniversary at the Chicago Theatre, as host Peter Sagal leads regular panelists (and some surprise guests) on a journey through the week's news and Wait Wait history. 2 Dope Queens cohost Robinson comes to Thalia Hall as part of the Chicago Humanities Festival, discussing her new book Everything is Trash, But It’s Okay. The lively photo collages of Chicago native Ralph Arnold take the spotlight in this new MoCP exhibit, which displays his works alongside pieces by Robert Rauschenberg, Ed Paschke and Barbara Jones-Hogu. Discover Chicago's history as a center of bicycle manufacturing and the city's influence on modern bike culture at the special display, curated by the Chicago Design Museum. Load up on craft beer, wine, ice cream and specialty snacks at Foxtrot's fifth location on Southport Avenue. The market also offers breakfast tacos, a doughnut sundae, coffee and cocktails to boot. Mobile sandwich purveyor Fat Shallot opened a brick-and-mortar restaurant in Lincoln Park, so you can chow down on spicy sesame fries, the truffle B.L.T. and chilaquiles nachos from a comfortable seat. New Hyde Park hotel SOPHY comes equipped with a full-service restaurant, offering brunch, lunch, dinner and cocktails inspired by the neighborhood's legacy for innovation. Situated below Oyster Bah in Lincoln Park, Crab Cellar serves unlimited Alaskan king crab and prime burgers five nights a week. Belly up for the gut-busting experience, which goes for $59.95 per person. What started as a juice bar has grown into 14 locations over the last four years. This month, the brand will reveal its first marketplace concept in River North, complete with a hot bar, grab-and-go items and a matcha bar.